Mind maps are an invaluable tool for students with language and literacy difficulties, and are a strategy that I often recommend in my reports. What are they for? Well what better way to explain, than to create a simple one to discuss the topic. Helping with understanding: Children with language difficulties can really struggle with taking in a lot of information, be it in a spoken or written format. 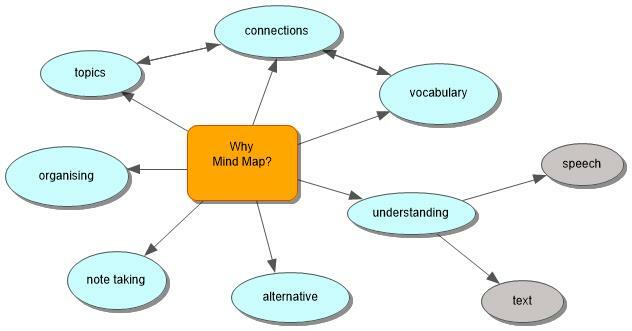 A mind map can assist a student in understanding new or complex ideas. Learn about a topic: Presenting a topic visually with a mind map, helps the student to get an overview of the topic, without getting caught up in details. They help the student to see connections between different thoughts and ideas and build on what they know. Mind maps can be a useful visual support when discussing a topic with students, as it reduces the demands on short-term memory and working memory. Learn vocabulary: A mind map is a great way to introduce new vocabulary. Templates can be created to cover different aspects of a word, such as definition, opposites, synonyms (words that mean the same), and associated words. Connections between words: We don’t learn language in a vacuum, it’s structured and organised. We file words in an organised system in our brain (unlike my office!). Using a mind map can help to visually show these connections, and thus help to build knowledge of word meanings and relationships. Increase reading comprehension: Children with language difficulties are at an increased risk of written language difficulties. A particular challenge can be understanding what is read, particularly as the literacy levels increase. Children can struggle at getting the gist of a story, and to grasp the key ideas, as well as have difficulty recalling key information. A mind map can help a child to make sense of all of this information. Brainstorm ideas: One of the most frequent uses of mind map is that it is a versatile tool for brainstorming. This is particularly important for children who may lack confidence and/or fluency in just getting ideas out. Plan and organise ideas: Once a student has brainstormed on a topic, then a mind map can be used to help them to organise their ideas. This can then form the basis for some written work or a presentation. An alternative to writing a paragraph: Having a child prepare a mind map on a topic and then speaking about it can be a great alternative to the student handing up a couple of paragraphs which have been produced following blood sweat and tears (and not just from the parents part!). Note taking: A mind map can be a useful alternative to writing notes in a more traditional way. It supports understanding of the content, organising the key points of a topic. I think that one of the great things about mind mapping, is that the process of creating one is as valuable as the completed product. If the student is actively engaged in the process, they are likely to have learned, and hopefully retained, a lot of information from the experience. http://thinkbuzan.com/ The website of Tony Buzan who has developed specific approaches to developing mind maps.